The 250SX West Region group is usually pretty stacked with factory talent, however there’s still an opportunity for aspiring riders looking to establish a name. Stay in close contact with the big names, and teams might just notice the new talent in the field. That’s what Ecuador’s Martin Castelo and Canada’s Jess Pettis are trying to do. They’ve been solid through the five round of racing thus far and have ambitions to keep it going—for now, though, their deals in the U.S. have expired. Castelo rode for the IB Corp. Yamaha team last year, a squad known primarily for its Racetrack Supercross reality show on YouTube. That team is gone, and Castelo hooked up for five races with the Bar X Suzuki team, which primarily operates a Suzuki amateur team. Castelo has made all five mains this year and grabbed an outstanding sixth in the San Diego mud. Pettis is Canada’s latest Great White North hope, and he’s 10th in points on his Red Bull KTM (Canada) machine. He has gone 10-12-11-11-5 in five rounds, recording a great one in the mud. Aaron Hansel talked to both after the race. Racer X: Best result of the year for you, nice job. Jess Pettis: It was a crazy main event, for sure. I had sixth or seventh gate pick heading into the main event, which was good, but I really didn’t get the best gate I wanted. I ended up going right beside [Colt] Nichols and it kind of zig-zagged a little bit. I just wanted to have that inside line and ended up getting a really good jump and got off to a great start. I almost holeshotted, which I was pumped about. Especially with it being a mud race, being sketchy, and having ruts everywhere. The main thing I told myself was to ride smooth, save the bike, and keep it on two wheels. Those were my main goals, and I pretty much did that. A few guys got by me but I rode up there right in the front with quite a few guys for most of the main. About halfway through I ended up going down and it took me a little while to get going and regroup. Shane McElrath was able to catch back up to me and got me with one or two laps to go. But I’m pumped. I came around and didn’t even know what place I got. I just did my best and ended up fifth, which was cool. How much did the track change between heat races and main events? Quite a bit. In the heat race it was sloppy with a really hard base. You could still jump some stuff but you were slipping around. The main event came and the rain stopped, and it basically just started tacking up. All the mud would stick to your bike and the lines were going everywhere. It was pretty sketchy. You’d take off from one jump, then you’d land and there would be ruts in different directions. It was pretty unpredictable. What are your plans for the rest of the season? Are you doing anymore or is this it? Originally I was just going to do the first five. I’m doing it with the KTM Canada team. They’re supporting me and I’m supporting myself too. We were just going to focus on the first five. I’m top ten in points now and I just got a fifth tonight. I think that’s going to help make the decision a little easier to keep going with it. I’ll talk to the guys this week and see what we can come up with. Hopefully we can do the whole West Coast, that’s my plan, and I’m going to try to make it happen. You’re doing much better this year than last. Year for sure, it’s all a big learning experience. Last year I came in and I’d had a big injury to my arm, I’d broken it pretty badly leading up to A1. So Oakland was my first race and it was a big learning experience. Supercross is obviously gnarly and it has the best guys in the world. It’s nothing that comes overnight but I’ve been working really hard at it and I feel like we’re going in a good direction for sure. I have good people in my corner and we’re going to keep working hard. So is it the plan to end up down here in the U.S. full time? For sure. Obviously down here is where it’s at. All the top guys are down here, the support is really good, and if you can make it down here you’ve made it. The money’s good and I really enjoy racing these guys in supercross. It’s where I want to be. I really enjoy racing up in Canada in the summer too. I’ve got a good little vibe going up there, and have a lot of fun. We’ll see if there are any options there in the future. You live in Prince George in British Columbia, right? Yeah, it’s basically in the middle of nowhere. I’ve actually been there a bunch of times. I know it snows a lot but what about rain? Did you ever ride in mud growing up? If so, did it help you tonight? I wouldn’t say I had to ride in the mud too much. Obviously there were a few rainy days, a few mud days, but I’d just go out there and have fun with it. Those days help you out at a race like this. Obviously there’s going to be mud races. But it’s more snow and really cold winters than anything else. Then it usually goes right to dry in the summer. When the weather is bad I come down here to Southern California and kind of put in the work down here. Racer X: How did it go? Martin Castelo: It was pretty muddy and I kind of got into a pileup in the first lap, I ran into a rider. I put my bike in neutral, stopped, rolled my roll offs, and took some mud off my helmet. At that point I thought I was pretty far back, and I just rode. I tried to jump as much as I could and not crash. I did that and ended up sixth, and I’m pretty happy about that. At the same time I’m kind of bummed because this was my last race with the team. It was only a five-race deal. I’m sitting thirteenth, I think, in the points, and not far from two people in front of me. But now I’m left with no ride for the rest of the season. I really want to ride. I’ve been talking to a few teams, trying to get in somewhere, even if it’s just to test the bike. I just want to stay active and stay riding. Basically after today I’m unemployed. I’m sorry to hear that. 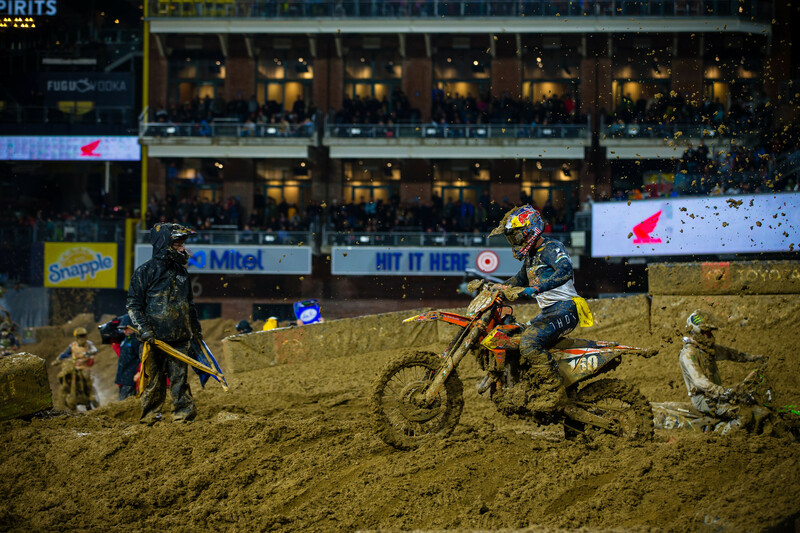 What happened to Racetrack Supercross? The owners didn’t really have any more interest in keeping it going. I think that’s the main thing, honestly. Last year they went pretty hard. We had a good team, maybe too many riders, but they just lost interest. What’s it like to race on a track like San Diego? Other than that, are you even trying to go fast out there or is it more about survival? It was just survival. Slow in the turns, don’t crash, and in the rhythm sections where you couldn’t jump I was trying to stand up as much as possible. If I sat I’d drag my legs and start using the clutch. Stand up, first gear, survive, and if possible, jump. How does a night like tonight compare to Seattle last year? The main here was super sticky and Seattle was sticky all day. Unfortunately I messed up my clutch in the heat and the LCQ in Seattle so I didn’t get to race. But I was super smart with that today and it ended up working good.